Source: Biographical and Historical Account of Kosciusko County, Indiana, Lewis Publishing Company, 1887, page 502-503, Census information, John W. Dunnuck family Bible, tombstones, etc. 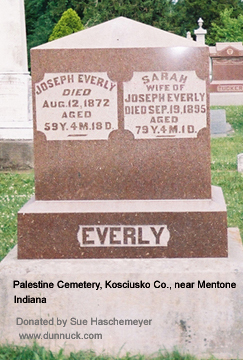 "Joseph EVERLY, deceased, one of the old and honored pioneers of Kosciusko County, Indiana, was a native of Pennsylvania, born March 24, 1813. When quite young he was taken by his parents, Peter and Parmelia (SMITH) EVERLY to Holmes County, Ohio, and was there reared to manhood. In his youth he learned the carpenter's trade, which he followed in connection with farming. He was married in Holmes County, Ohio, August 15, 1834, to Miss Sarah Mackey, who was born in Pennsylvania May 18, 1816, she having been brought to Holmes County by her parents, James and Elizabeth Mackey, when three years old. Seven children were born to this union Permelia, Washington, James, Elizabeth (deceased), Peter, Margaret M. and William. 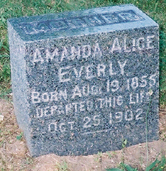 In 1846 Mr. Everly came with his family to Kosciusko County, Indiana, and shortly after his arrival here settled on the farm which is yet occupied by his widow. The farm contains eighty acres of choice land, and is pleasantly located in Harrison Township. The land, when our subject first came her, was covered with a heavy growth of timber, he having to clear a part before erecting his primitive hewed-log house. The brought his land from a wild state under good cultivation, making all the improvements on the place and as more properous times came, his long cabin was replaced by a more modern frame residence. He was an earnest member of the Christian church, in which he served as a deacon. He was highly esteemed throughout the county, having during his long residence here gained the confidence of all who knew him, and in his death Kosciusko lost one of her best citizens. His son, James Everly, was born in Holmes County, Ohio, October 4, 1839, but reared to manhood in Kosciusko County. He was united in marriage September 11, 1870, to Miss Mary Sarber, a daughter of John and Caroline Sarber, who were early settlers of Kosciusko County, both now deceased. They are the parents of four children -- Joseph, John, Lilian and Edwin. James Everly and his family reside on the homestead in Harrison Township. He is engaged in agricultural pursuits, and is the owner of land. In politics he is a Democrat. Washington Everly, another son of our subject, served as a soldier about two and a half years in the war of the Rebellion, and died of exposure while in the service. Another son, William Everly, was formerly a teacher in Kosciusko County, and for a time served as trustee of Harrison Township. He is now residing in Marshall County, Indiana. He married Amanda Dunnick, of Kosciusko County, and the are the parents of two living children Mertie Bell and Lola Dell. Peter, a farmer in Harrison Township, married Pheobe (nee Dunnuck - a widow - sh) Borton, and has child John Earlston. Permelia married a farmer of this county, and has three children -- Mary, Permelia A. and Clayton. Elizabeth married William Andereck, and was the mother of three children -- Ida Alice, deceased, Emma Isabella and William Sherman. (page 503) Maggie M. taught school several years in Kosciusko County, and married M. L. Van Dorn, also a teacher, and has two children Oliver and Effie Bell. In political views the Everly family affiliates with the Democratic party." 1 Leonard EVERLY b. Feb. 20, 1760 Frederick Co. MD, d. July 7, 1830 in Fallowfield twp. Washington Co. PA. (Jr.) He was the son of Johann Leonard Eberle (Sr) who was born about 1720 in Eiterbach, Baden-Wurttemberg, Germany. He emigrated October 17, 1749 - to Philadelphia - and wife Eva Marie BECKENBACH who was born about 1718 in Eiterbach. They married in Eiterbach February 8, 1739. +Elizabeth PLATTER - b. June 22, 1765 in Frederick County, MD. Source of Parents & grandparents of Peter: Rootsweb 6/12/04 by Richard W. Parsons. To Holmes Co. OH after 1813 while Joseph was quite young. + Phebe (DUNNUCK) widow Borton March 5, 1882 in Kosciusko County, IN. (sister to Amanda DUNNUCK) daughter of John W. and Henrietta DUNNUCK b. Aug 18, 1839 Kosciusko d. Mar 2, 1915, Burket, IN (no issue by Pheobe) After Peter's death Phebe married in 1904 to Aaron Mayer. 5. John E. EVERLY (1st wife - who?) 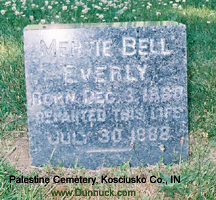 b. ca 1868 d. 1952, buried Palestine Cemetery, Kosciusko Co., IN with Peter and Phebe. 5. Lola Dell EVERLY(Nov. 11,1885-Apr 9, 1951). 5. 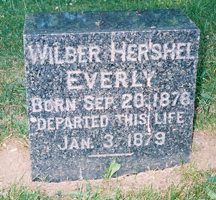 Wilber Hershel EVERLY (1878-1879). d. 30 Aug 1902 in Warsaw Co. IN, buried Oakwood Cemetery, Kosc. Co. IN. living together with daughter Sarah J. Lansbury at time of death. + Harriet B. REED in 20 Oct. 1909 in Kosc Co.
4. Samuel F. MANELY b. ca 1862 in Kosciusko Co., IN d. age 24 obit publ Indianian Republican Oct. 10, 1889. Buried Oakwood Cemetery.